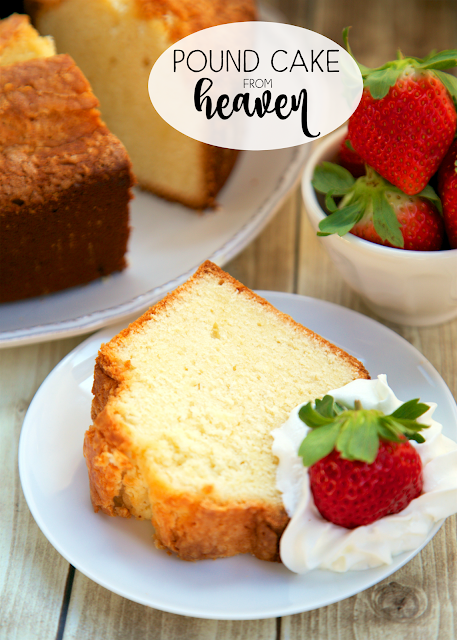 Pound Cake from Heaven - delicious Southern pound cake recipe! Sweet, rich and still as light as a feather. Great for a potluck; everyone loves this! Serve with some fresh whipped cream and strawberries. Can freeze leftovers for a quick dessert later!! 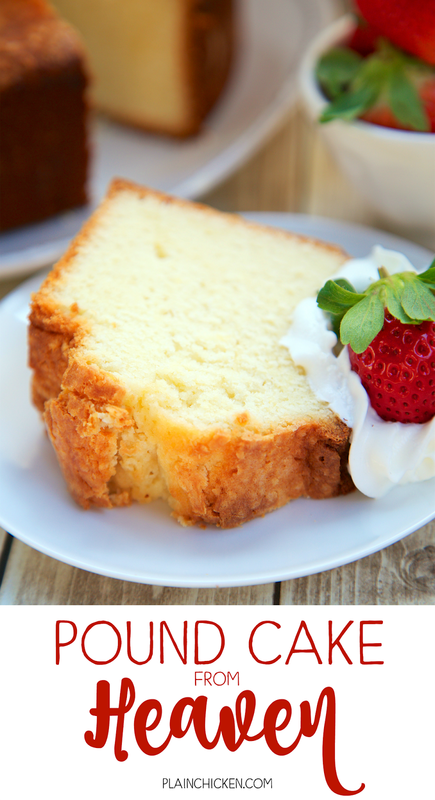 You can never go wrong with a good pound cake for dessert. 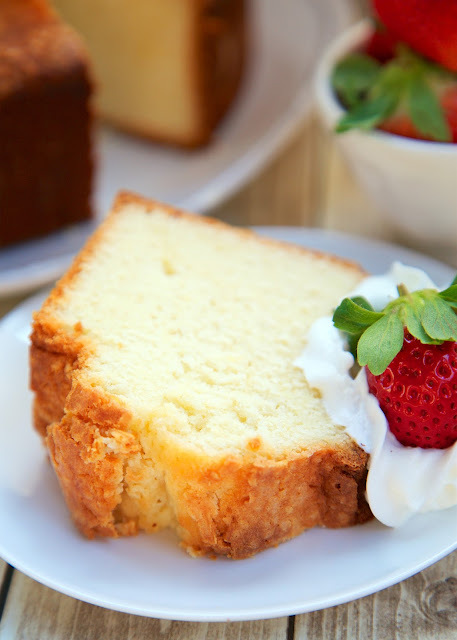 This pound cake is heavenly! I think the key to this pound cake is using White Lily flour. It makes the cake so light and fluffy while still having the richness you expect from a pound cake. I baked this in a tube pan. I wanted to have that beautiful, yummy crunchy top to the pound cake. You can use a traditional bundt pan, but that crunchy goodness will be on the bottom of the cake. It will still taste delicious though! We served this with some whipped cream and strawberries. SO good! This is a great dessert for a potluck. It is so easy to make and everyone loves it! Preheat oven to 350 degrees. Grease and flour a 10-inch tube pan. Set aside. Place butter in the bowl of a stand mixer and beat at medium speed for 6 minutes, until really light and fluffy. Gradually add sugar and beat for an additional minute. Add eggs, one at a time, beating just until the yolk disappears. Combine flour, baking powder and salt. Combine evaporated milk and heavy cream. Add flour mixture and cream mixture to butter mixture alternately beginning and ending with flour (1/3 flour mixture, 1/2 cream mixture, 1/3 flour mixture, 1/2 cream mixture, 1/3 flour mixture). Beat at slow speed after each addition. Stir in vanilla and almond extract. Pour batter into prepared pan. Bake for 60 to 75 minutes or until a long wooden pick inserted in center comes out clean. Cool in pan on a wire rack for 1 hour. Remove from pan and continue cooling on wire rack until completely cool. Cake flour is not the same thing as soft-wheat flour. Vanilla paste is fine. thank you. You like this as well/better than the 7-Up?? I just made this and I question the 2 Tablespoons of vanilla? Never made any cake with that much vanilla??? I used 2 tablespoons of vanilla, but use as much as you are comfortable with. Can you explain the difference between a tube pan and a bundt pan? I don't know which I have! Jessica, A Bundt pan have designs a Tube pan does not. I like Tube pans for my pound cake. Bundt pans are pretty- I just like the old fashioned cake look. Go on Amazon and look the the two pans up. I hope this helps. I know it is an old post. @Jessica A tube pan has a hole in the center with a flat bottom and a bundt pan has a hole in the center with a curved bottom and ridges/indentations all around. 5 0z or 15 0z can of evaporated milk? White Lily regular flour - not self rising. I am used to it being called (Plain) or (all purpose) I think some refer to it as cake flour, but to me, cake flour is Swans/in a box. not packaged in a paper bag like the five pound bags. Bernie - White Lily flour is NOT cake flour. The White Lily flour is packaged in a paper bag like the other brands of flour. I'm sorry if my reply is confusing, maybe I should have said ... regular flour is (Plain or All Purpose) flour. Can you use a regular 9in round cake pan? This recipe is AWESOME I make it every other week as it is so versatile, I used a regular loaf pan and a square pan, sprayed with pam-flour, dividing the mixture in both. Once cooked and cooled, the one in loaf pan I slice and the one in Square pan well I cutinto squares ,lol, they come out perfect every time, after about 60 min. I also used plain unbleached flour, works for me, thank you Stephanie! This recipe is awesome and sooo versatile. I used plain unbleached flour and divided the mix in one standard loaf pan the rest in a square pan ,sprayed with pan flour. After about 60min 2 beautiful pound cakes. Cool and slice the loaf pan one and cut into squares from the square pan, I usually give one away or freeze it, thank you for the greatest pound cake recipe ever Stephanie! I made this 2 days ago using cake flour as it was all I had, and it was perfect! I just made this in a 10 inch bundt pan. It over flowed and I have a terrible mess. Don't use a bundt pan. If you do use a bundt pan, make sure to leave some room at the top of the pan so the cake can rise. I usually leave at least an inch - you will more than likely have left over batter. Has anyone substituted the heavy cream with success,if so with what? Yes, I used Half-n-Half today in this recipe and it was just fine. 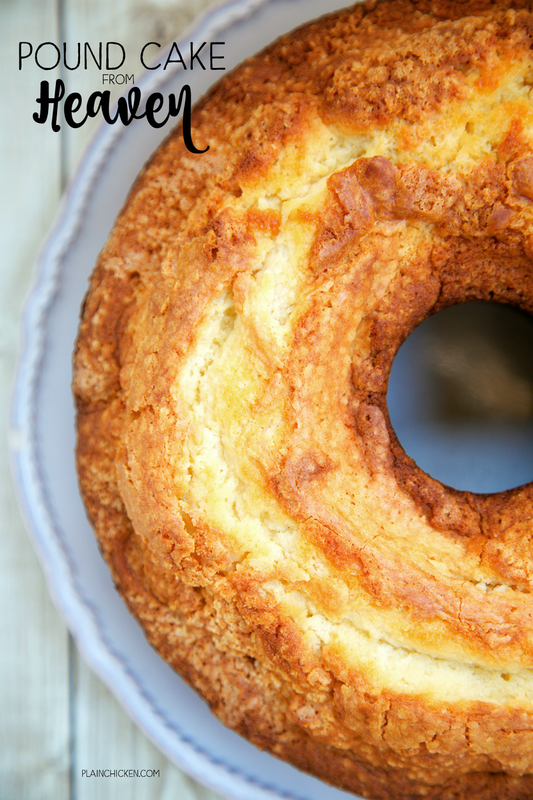 I need some help...I love this recipe, but everytime I make it, it falls in the center around the Bundt pan. I am using the exact right ingredients, following directions exactly. Any ideas??? It's driving me crazy. Do you think I could substitute the gravy cream with sour cream? I honestly don’t know. I would have to test it out to be sure. Let me know if you try it. Fingers crossed! This pound cake is outrageous! I followed the recipe exactly, and it turned out perfectly! I will never use another pound cake recipe again...thank you so much!! Is it okay to use generic brand whole wheat flour? You can try it. It will completely change the texture of the cake. Any tips for converting this to two loaf pans? I’m curious about baking times. I am taking it for a tailgate and would like to freeze one for next week. I made this yesterday. I followed the recipe exactly. I’m not sure about the almond flavoring. It is quite strong. I think I will omit it next time. My family loved it!! It’s already half gone. Lol!